It is essential to start by recognising that not all change is progress, and that there are, inevitably, differences in how different people interpret what they mean by progress. The importance of that difference between change and progress is at the heart of most of our decision-making difficulties, especially in particularly sensitive areas that involve our values and ethics. Wise decision-making also, inevitably, involves moral/ethical choices and this occurs every time we take a decision. Hence it is not surprising that we find that the comments we might define as Wisdom are essentially comments about the relationship between people, or their relationship with society, and the universe as a whole. These statements are generally globally recognised as relatively timeless and they are insights that help us provide meaning to the world about us. In theory, the use of teams, committees, even opinion polls (and other efforts to capture The Wisdom of Crowds) are attempts to capture collective Wisdom. But what certainly surprised me when I started looking at this subject, was the paradoxical gap between how critically important this area was in all our lives, and yet how often it seems to be almost totally ignored in Futurist, Strategy, Knowledge Management, and even Ethics, literature. Another paradox is that we appear to be spending more and more time focusing on learning knowledge, or facts, that have a relatively short shelf life, and less and less time on knowledge that overlaps with Wisdom, that has a long shelf life. Why is that? What can we do about it? While Power is the ability to make things happen, Responsibility is driven by attempting to answer the question: ‘In whose interest is the Power being used?’ Yet the two concepts of Power and Responsibility are simply different sides of the same coin; they are the Ying and Yang of our behaviour; they are how we balance our relations with ourselves with the interests of others, which is at the core of what we mean by our values. Power makes things happen, but it is through the exercise of an appropriate balance between Power and Responsibility that helps ensure as many ‘good’ things happen as possible. This critical relationship between Power and Responsibility is reinforced by examining how these two concepts interact in practice, through a variety of different management dimensions. First, it is useful to visualise a two-by-two (Boston) box (see diagram below), with Power (+&-) along the horizontal axis, and Responsibility (+&-) along the vertical. In one square, where there is a strong Power-driven (+) culture, combined with little sense of Responsibility (-), there is a high probability of megalomaniac or dictatorial behaviour. While another square would combine a high degree of Responsibility (+), with little Power (-), which is a classic recipe for stress. In fact, this is a major cause of relatively unaddressed individual, organizational and societal stress, reinforced by many empowerment programmes, that are more concerned with giving individuals more Responsibility than giving them more real authority (ie: Power). 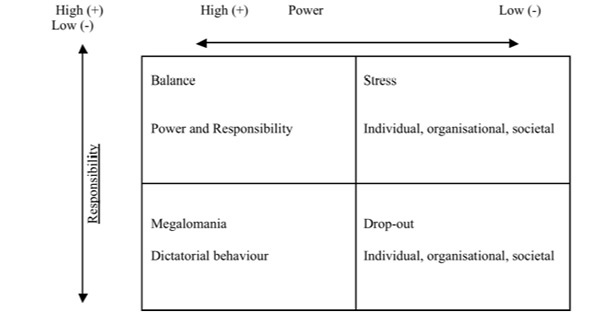 A further square has low levels of both Power (-) and Responsibility (-) producing the net result of ‘drop-outs’, whether individual, organisational or societal. This category is often viewed as an attractive option when individuals consider it relative to the alternative to the stress, which is all too often associated with situations where the feeling of impotence is associated with the feeling of Responsibility. The ideal is to work towards the final square where there is an appropriate balance between Power and Responsibility (+/+). Although this compartmentalisation is an inevitable simplification, it does show how the underlying pattern of Power <> Responsibility relationships influence individual behaviour, which is particularly critical in areas related to ethical decision making. 1. Organisational culture can be considered as either one that encourages the sharing of information, as opposed to a ‘Knowledge is Power’ culture. (Although I consider it is more appropriate to use the word Information, rather than Knowledge, for reasons that are discussed in more detail later.) Almost all management techniques (Total Quality Management, Learning Organisations, and Knowledge Management, to name but three) are based on the assumption of a sharing knowledge culture and these techniques are unlikely to be effective within a ‘knowledge is power’ culture. Teams, and virtually all other management techniques, flourish best under a Responsibility-driven culture. In addition, as we increasingly move further into a knowledge economy, the effective sharing of information/knowledge will become an even more critical success factor for all our decision-making whether as individuals, within organisations, or for society as a whole. 2. It is often argued that people oppose change, when the underlying problem is that there is a difference of opinion on how to define progress - or what we mean by ‘better’. In a culture where those affected by change are either in control, or they trust those driving the change, there is usually general agreement on how progress is defined, and there is little opposition to any change initiatives. The greater the trust levels, the easier it will be to undertake change, simply because there is general agreement that the change will be equated with progress. Despite all the talk of the need for change in many situations, what is really required is the need for greater emphasis on the concept of progress. Unfortunately, it is very rarely the case that all change can be equated with progress. This difference between change and progress is at the heart of most organisational difficulties in this area, partly because the vast majority of change is still top down driven, and this is, unfortunately, combined with the widespread existence of a Power-driven culture, which has fostered a breakdown in trust in far too many situations. 3. Another important dimension of the Power-Responsibility relationship arises in many organisations where they experience the damaging effects of bullying, corruption, as well as sexism and racism. These problem behaviours are, essentially, in the vast majority of cases, essentially little more than the ‘Abuse of Power’. If individuals took a more Responsible-driven (i.e., ‘others focused’) approach to their personal relationships, there would be an enormous reduction in these harmful anti-social behaviours. 4. The issues considered above are also reflected in the language we use to discuss them. Phrases, such as ‘Corridors of Power’, ‘Power Struggles’, even ‘Lusting after Power’, are widely used, but would not attitudes and behaviours be different if the language used was more focused on using phrases such as ‘Corridors of Responsibility’. Why do we never hear about ‘Responsibility Struggles’? And certainly there are very few, if any, examples of people being accused of ‘Lusting after Responsibility’. Why not? If Power and Responsibility are two sides of the same coin, shouldn’t the words Power and Responsibility be virtually interchangeable? The greater the level of a Responsibility-driven decision-making culture, the more effective and sustainable will be the consequences of that process; and the less regulation will be required to manage the inter-relationship between the various stakeholders. In contrast, more and more regulations will be needed in an attempt to regulate Power-driven cultures, where those regulations are designed, in theory, as an attempt to make the decision-making processes more accountable, and so encourage more responsible behaviour. If we all behaved more responsibly in our relationship with each other, there would be much less pressure for more and more regulation and legislation. In addition, it can be argued that it was a pity that there has been such an emphasis on ‘Rights’ during the twentieth century (The UN Universal Declaration of Human Rights, the European Declaration of Human Rights, etc. ), rather than emphasising a combination of Rights with Responsibilities. The reason for this apparent separation is worthy of further exploration. First, those arguing for Rights, tended to feel that any emphasis on Responsibilities diminished their case for Rights, while those with Power, who feel they would have to give up some of it by making themselves more accountable, also feel that any emphasis on Responsibilities would only result in undermining their position. Unfortunately, the implicit conspiracy between these two positions resulted in an important opportunity having been missed. Increasingly political agendas, both national and international, are now being driven by a dual focus on Rights and Responsibilities, and this also needs to be reflected in our personal and organisational agendas. Again, in almost all current ethical debates (as well as legal and other regulatory structures), the ultimate objective is to try to achieve the appropriate balance of Rights and Responsibilities. If individuals behaved more Responsibly and ethically towards each other, it would be much more likely that the net result would be a higher standard of ethical decision making overall. This is a classic case where the outcome and process are closely inter-linked. In the context of the above comments, it is worth mentioning that probably 90% of violent behaviour arises because there is an imbalance, or discontinuity, between Power (self-focused), and our sense of Responsibility (others-focused), which leads to a breakdown in the ability to communicate effectively between those involved. This breakdown becomes even more acute, and problematic, if it is combined with an inability to undertake a constructive dialogue in the first place—a point that will be expanded on later. Why is this relationship between Power and Responsibility so important to the debate about leadership and ethics? Simply because, in essence, leadership is nothing more than the ‘well informed, Responsible, use of Power’. The more the leadership related decisions are Responsibility-driven (i.e., the more they are genuinely concerned with the wider interest), not only will they be better informed decisions, but the results are much more likely to be genuinely reflect the long term interests of all concerned, which also happens to be a sound foundation for improving their ethical quality. But where does Wisdom come into this argument? In essence, the above leadership definition (‘the well informed, Responsible, use of Power’) is exactly what could also be called ‘Wise Leadership’. In this context the concepts of leader, leading and leadership are used interchangeably, although it could be argued that leaders are individuals (including their intentions, beliefs, assumptions, etc. ), while leading is their action actions in relation to others, and leadership is the whole system of individual and social relationships that result in efforts to create change/progress. However, the above definition can be used to cover the integrated inter-relationship of those three dimensions. In my view, there is an enormous amount of literature that explores Wisdom, and this can provide useful insights into what works and what doesn’t? However, partly because, for various reasons, the word Wisdom has been widely misused and misunderstood, it might be useful to explain where I am coming from and how I got involved in exploring this generally neglected (except for a few notable exceptions, some of whom are listed at the end of this article) dimension of thinking about how people, organisations and society work well in practice. My background is Science, with Engineering and Business degrees, and a zig-zag career in industry and finance that ended up with my writing and lecturing on Strategy. I consider Strategy to be about ‘understanding what makes organization, people and society work’, and what helps them work ‘better’. Recognising that ‘better’ is a values-driven word. In other words, I have a very practical approach to these issues. It is worth emphasizing that I didn’t have a classical education, although a trip to Troy and Crete over 25 years ago opened my eyes to the importance and influence of old civilizations, and trips to Nepal and Tibet a few years later compounded that interest with insights into various religions and philosophies. Perhaps I should also mention that in this journey and discussion, I have no religious agenda. I consider myself to be a ‘positive agnostic’. I am interested in, almost compulsively, asking questions and searching for answers; especially to the big questions, such as: What is life really all about? and How do we make sense of fitting all the pieces together? "Effective learning is the only sustainable competitive advantage." "Only if the rate of learning is greater than the amount of change are we likely to find change equated with progress?" The net result of this emphasis on learning naturally leads to the question: What is it important to learn? Trying to answer that question leads to, or is at least reinforced by, the massive growth in the Knowledge Management industry. I was brought up on the Data/Information/Knowledge pyramid, which ended with Wisdom at the top; where Wisdom was considered as the most important. Yet most Knowledge Management books, with a few notable exceptions, do not discuss the role and importance of Wisdom. Also in the late 1990’s, I was involved in a number of ‘Futures’ related activities in the run up to the Millennium, and these focused on exploring the big issues, such as: Where have we all come from? and Where are we going? In fact, the recent move into the new Millennium was probably the most focused point in human history for exploring these questions. In these discussions there was an enormous emphasis on technology. But, somewhat to my surprise, I found that almost no-one had looked at what had we really learned over the past two or three thousand years that was really important to pass onto the next generation—i.e., Wisdom. (An attempt to fill that gap lead to a project for the World Future Society, ‘Messages for the New Millennium’, which is still on their website, http://wfs.org). Wisdom is something everybody seems to talk about; we all appear to want more of it, yet few people appear to reflect on what Wisdom really is, especially in management/leadership literature. And there is little consideration of how can we learn Wisdom more effectively? An over-riding objective of these brief comments is simply that it would be very useful for us to try to rehabilitate the word / concept of Wisdom. But what do we really mean by Wisdom? Wisdom is often meant as the ability and desire to make choices that can gain approval in a long-term examination by many people. In this sense, to label a choice ‘wise’ implies that the action or inaction was strategically correct when judged by widely-held values…. Be informed by multiple forms of intelligence – reason, intuition, heart, spirit, etc. More briefly Wisdom can be considered as: "Making the best use of knowledge…by exercising good judgement’….‘the capacity to realise what is of value in life for oneself and others"….Or as "the end point of a process that encompasses the idea of making sound judgements in the face of uncertainty." I recognise there is a risk in expounding the concept of Wisdom that I might be seen to be supporting the view that somehow I know all the answers. That is certainly not the intention. The prime objective is simply to raise some questions that, in my view, do not appear to be asked often enough. The first step is always to start by being reasonably sure that we are asking the right questions, and that we are improving the quality of the conversations/dialogue about those questions, answers and decisions. This is a particularly important starting point when these conversations involve the sensitivities associated with any discussion of values/ethics related issues. Wisdom statements are those that appear to be useful in helping us all make the world a better place in the future. They are not absolute statements; they are simply statements that reflect our understanding of behaviour patterns that appear to work in a positive direction in a sustainable way. This statement is, in itself, full of explicit and implicit value judgements. But a statement of Wisdom is only useful if it also checks out with our own experience. Firstly, the word 'better' inevitably means that we are involved in considering the whole complicated subject of values that are embedded in the question: "What do we mean by 'better'? It should surprise no one that a critical part of the content of any Wisdom statement is the extent to which it incorporates judgments about values. In fact, in many ways, that is a critical part of the definition of what we mean by Wisdom. But that does not mean that all statements that reflect values can be defined as Wisdom; the extra dimensions required are that they are widely accepted and that they have 'stood the test of time'. In addition, while all wisdom is reliable, useful, information, not all reliable information can be considered as Wisdom; they are insights into values, people and relationships that work. They are not simply technical statements that have no human or relationship dimension. Secondly, it is important to recognise that in trying to 'make the world a better place for us all' we can easily run into potential areas of conflict. For example, making things 'better' for some people is sometimes at the expense of making it worse for others. Much of the conflict that arises in this area is because different people use different time horizons, when they talk about the future. Some people are obsessed with tomorrow, whilst others are primarily concerned with what they perceive to be the needs of the next hundred years. How, or whether, differences in perspectives are resolved is critically dependent on the quality of dialogue between the parties. In my view, there are no absolute answers; consequently the only way to make progress is to try to ensure that the quality of the dialogue between all concerned (i.e., all the stakeholders) is as effective as possible. In the end, the quality of our decisions depends on the quality of our conversations/dialogue; that is not only dialogue about information but, perhaps even more important, it is about what is the best way to use that information. In other words it is about our values. Dialogue facilitates both the transfer of technical knowledge, as well as being an invaluable part of personal development. Having a quality dialogue over values is not only the most important issue we need to address, but it is often the most difficult. In this area, there is a paradox with the concept of passion, the importance of which is emphasised in much current management literature. If this passion is exhibited by a Power-driven person who tends to think they have all the answers and they are all too often not interested in listening, then holding a positive dialogue can easily become problematic! The only way to ‘square that circle’ is to ensure that all the other people involved are convinced of their integrity, and that they are reflecting a genuine concern for the wider interest in the decisions that are taken. The greatest challenge that most organisations face is how to manage effectively Power-driven, passionate, people in such a way that their priority is encouraged to be consistent with the long term interests of the organisation as a whole, rather than just with their own personal interests. Incorporating this wider (Responsibility-driven) interest into our decision-making at all levels, irrespective of whether they are personal, organisational or societal, is the ultimate test of both values and leadership. In addition, it is important to recognise that democracy does not produce perfect answers; it is simply the best system relative to the alternatives. (As Churchill put it: "It has been said that Democracy is the worst form of government except all those other forms that have been tried from time to time.") The critical element of any democracy is not that the will of the majority prevails, but that the interests of minorities are understood and protected. And the most effective way of producing the best balance between the two is through effective dialogue between all those involved, within the framework of the Responsible use of Power. Although it might sound paradoxical, it is not unreasonable to argue that the degree to which we use our freedom Responsibly, the more freedoms we will have. Another approach to this dilemma is recognising that the greatest challenge to any concept of freedom lies in attempting to answer questions such as: How far can we be allowed to be free from our Responsibilities? and Who decides? As has been mentioned already the traditional approach to the data-information-knowledge-Wisdom link sees a close relationship within a pyramid that starts with data at the bottom, moves through information and knowledge, to end with Wisdom at the top, giving, in theory, greater 'added value' as we move up that pyramid. In my view, this progression has a fundamental flaw, arising from the fact that the relationship between these four items is not linear and, as a result, there is no basic step-by-step, linear, movement up the pyramid from data to Wisdom. The mechanistic view of that progression is partly a reflection of the Newtonian tradition, repackaged by the Management Science of Taylorism. In practice, the integration of all four elements requires at least one, if not two, quantum (/qualitative) jumps. Information can certainly be considered a ‘higher’ form of data, as it provides greater context and so greater meaning. However, the transformation of information into knowledge requires the first quantum jump. A book that describes how a jet engine works is an example of information. It is only when information is actually used that it is turned into knowledge. In a similar way science produces ‘value’ and ‘values’ free information. It isn’t until something is done with that information that we need to recognise that all our choices (/decisions), are concerned with ‘adding value’, as well as being values driven, and these decisions are driven by our perception that one alternative is somehow ‘better’ than another. In essence, knowledge is information in use and, of course, it is through its use, and through the feedback learning loop, that you gain further information, which then gets turned into even more legitimate knowledge based action. Overall, this is a never ending, dynamic, process. But where does Wisdom come in? Wisdom is the vehicle we use to integrate values into our decision-making processes. It is one thing to turn information into knowledge that makes things happen through its use, but it is quite another thing to make the ‘right’ (/’good’/’better’) things happen. How we actually use knowledge depends on our values. Instead of moving up from data/information/knowledge to Wisdom we are, in parallel, moving down from Wisdom to knowledge—and that is how we incorporate our values into our decision-making. Hence we can see the application and relevance of what is generally called Wisdom. It is only justified to consider that decisions can be reduced to a cost/benefit analysis, if it is possible to quantify all the ‘values’ elements within the equation in monetary terms. In the past values have been included implicitly, whereas today that dimension invariably needs to be made much more explicit. All decisions involve the integration of the economics dimensions of ‘added value’, with the ethical (i.e., ‘right’) dimension of ‘values’. Of course, this is a dynamic process and there is continual feedback from the experience of our actions into whether we need more information. But what and how much further information is required is also a values influenced decision. It is how values are assessed and applied, both as the ends and means that are critically important dimensions in all our decision-making. It is our values/Wisdom that defines the limits of what we consider acceptable choices in the first place and those decisions determine our knowledge/action priorities. These priorities then determine what information is required, in order to try to ensure that the decision is as well informed as possible. In turn that information need determines what further questions have to be asked about what additional data is required. In practice, we need to understand how these two pyramids/progressions relate to each other, if we want to understand how we incorporate values into our decision-making processes, as well as understand why Wisdom plays such an important role. It also needs to be recognised that the way the word (/concept) Wisdom, has been used in the past has not always helped this process. "Wisdom is the right use of knowledge. To know is not to be wise. Many people know a great deal, and are all the greater fools for it. There is no fool so great a fool as a knowing fool. But to know how to use knowledge is to have wisdom." One dimension of any study of Wisdom that should not come as a surprise, because it consists of statements about relationships between people, either individually or collectively in societal context, or about our relationship with the universe as a whole, is their general universality in that they have ‘stood the test of time’. Many of the important messages about the state and future of the Human Race were made over a thousand years ago, in China, the Middle East and other early sophisticated societies. As a result Wisdom insights are very similar irrespective of which part of the world identified as their source. In my view, Wisdom is by far the most sustainable dimension of the information/knowledge industry, although I recognise that this article has not covered how you could teach Wisdom. Or whether it is teachable? Or is it, like values? In many ways, probably not. But it is learned somehow, and as far as I know, there is no ‘values’ gene. Consequently, there are things that we can all do to help manage the learning processes more effectively, although detailed consideration of these are outside the scope of this paper. Surely H.G. Wells ((1866-1946), The Outline of History (1920)) was right when he said that: "Human history becomes more and more a race between Education and Catastrophe." We need to recognise that the more change that is going on in society, the more important it is that we make sure that our learning is as effective as possible. That is the only way we have any chance of being able to equate change with progress. If we want to have a better future the first - and most important - thing that we have to do is improve the quality and effectiveness of our learning. And this learning process starts very early on in our lives, with our basic values being often difficult to change later on in life. As has been already mentioned an underlying assumption of the word 'learning' is that we are trying to do things 'better'. We are trying to improve things. We are trying to make progress. Of course, the concepts behind the words: 'improve', 'better' and 'progress' are powerfully values-driven. Organisations and individuals don’t have a problem with change, only with how we perceive progress. And our success in this area is, of course, critically dependent on the quality of our dialogue as discussed earlier. It is not easy to be optimistic about current trends, when the media is so focused on sensationalism and confrontation. This is not only an issue for the mass media, but it is also fostered by many, so called serious programmes where confrontation, rather than constructive consensus building dialogue is encouraged in the name of ‘good television’ from Coronation Street to Newsnight, as examples from the UK. It is also my impression is that there is evidence to support the view that our ability to hold constructive conversations is declining. If this media agenda has a significant influence on our political agenda, and our democratic processes, it cannot be ignored. These pressures can be particularly important when considering potentially sensitive ethical issues. As a result it is not the issues themselves, but the way we discuss them, that ultimately determines the quality of the action taken. Unfortunately, much of the media has more interest in encouraging dissent and confrontation than constructive dialogue and consensus over these issues. This issue is not easily addressed but it is, at last, a start to for it to be more widely recognised. It is probably the case that about 80% of the violence in society is simply due to a breakdown in our ability to hold constructive conversations with other each other. "Knowledge can be communicated but not wisdom. One can find it, live it, be fortified by it, do wonders through it, but one cannot communicate and teach it." "By doubting, we come to examine, and by examining, so we perceive the truth." "If you won't be better tomorrow than you were today then what do you need tomorrow for?" "Education is your passport to the future. For tomorrow belongs to the people who prepare for it today." What are the implications of these ideas for us all? In recent years we have seen considerable effort to move people from the idea of 'Working Harder' to 'Working Smarter'. But what is really needed is to move beyond 'Working Smarter' to 'Working Wiser'. We need to move from ‘The Knowledge Society’ to ‘The Wise Society’. And, the more we move along that progression, the more we need to recognise that we are moving to a situation where the important issues primarily reflect the quality of our values, rather than the quantity of our physical effort. If we want to improve the quality of our decision making, the focus needs not only to be on the quality of our information but, perhaps even more importantly, on the ‘right’ use of that information, hence the importance of improving the dialogue related issues mentioned earlier. If we want to manage complexity successfully, and make progress in the world today, we have to start by getting the simple things right. This needs to be based on more effective understanding, and use, of accumulated Wisdom. Unfortunately, all too often problems arise precisely because we haven't got the simple things right in the first place. This includes the need for a greater emphasis on sharing knowledge, rather than the more traditional concept of 'Knowledge is Power', as well as the need to combine that with being sure that we start by asking the right questions. Probably the most important of those simple things to get right is for leaders to 'walk the talk'. It is relatively easy to know what is the ‘right’ thing to do; the hard thing is to ensure that it gets done. It also appears to be relatively easy to recognise Wisdom on paper, but it appears to be so incredibly difficult to be wise in practice. Stakeholder analysis can help understand the map of the Power/Responsibility relationships within decision-making processes. All decisions require trade-offs and this involves judgement between the interests of the various stakeholders, within a framework of a genuine concern for the long term—and the wider interest. It is also the case that where there is no common agreement over objectives, values are invariably the dominant agenda in any discussion. It is here that Wisdom reflected in both content and process, can be critical. How often do we seem to be either obsessed with technology—or so focused on the experience of the here-and-now—that the issue of Wisdom appears to be virtually ignored? Are we really focused on what is important, rather than on just what is easy to measure? One reason for the recent obsession with an information-based approach is because that provides a relatively easy framework within which to get agreement of decisions. Any focus on the values dimension can make decision-making much more problematic. There are two answers to such a view: First, values are implicitly involved in all decision-making and all we are doing is making the discussions about the values dimension more explicit, a process that is, after all, at the core of Knowledge Management. It is also through making information/knowledge more explicit that we can improve the effectiveness of our learning processes. Secondly the evidence suggests that there is much more agreement across all cultures and religions about fundamental human values (and Wisdom) then is generally recognised. This view is confirmed by both the work of the Institute for Global Ethics, as well as an unpublished dissertation by Richard Hawley Trowbridge on The Scientific Pursuit of Wisdom, which found ‘no indications of a conflict between religious and practical wisdom’…and ‘little difference in levels of wisdom between women and men’ (email communication from author 01/09/2005). Finally, I come back to the point I made at the beginning. Why are we interested in Ethics and the Future? The answer is, simply, that we are concerned with trying to make the world a ‘better’ place. But for whom? And how? To answer both questions we need to re-ask fundamental questions: Why do we not spend more time to ensure that the important messages that we have learned in the past ('Wisdom') can be passed on to future generations? How do we ensure these messages are learned more effectively? These are critical strategy questions, as well as being at the very foundation of anything we might want to call 'The Knowledge Economy', although what is really needed is to focus on trying to move towards a concept closer to ‘The Wise Economy’. This focus naturally overlaps with the greater attention recently being given to values/ethical related issues and ‘the search for meaning’, in management/leadership literature. I hope I have not given the impression that I know what this illusive concept of 'Wisdom' actually is? Or how we can pass it on more effectively? Or what the answer is to all the ethical dilemmas we currently face, or will face in the future? All I am arguing is that we urgently need to give the whole subject of Wisdom much more serious attention in management literature than has been the case is the past. Wisdom is critical to our understanding of ‘The Knowledge Economy’ and ‘The Knowledge Society’, as well as Strategy and Ethics in general. If we cannot take Wisdom seriously we will pay a very high price for this neglect. We need to foster greater respect for other people, particularly those who have views, or reflect values, that we do not agree with. This requires us to develop our capacity to have constructive conversations about the issues that divide us and that, of itself, would go along way to ensure that we improve the quality of our decision making for the benefit of all in the long term. This paper has argued that understanding, and integrating, the relationship between Power and Responsibility needs to result in a greater emphasis on the more Responsible use of Power and this needs to be combined with a greater emphasis on a Wisdom-based approach. Together this would enable us both improve the quality of the conversations/dialogue that are so vital in the management of the decision-making processes, as well as improve our ability to evaluate more effectively the ethical issues themselves, today and in the years ahead. We need to recognise that, overall, Wisdom is a very practical body of knowledge (/information) that has an incredibly useful contribution to help us understand the world we live in. Such an approach would help us all take ‘better’ (/wiser) decisions, lead ‘better’ lives and experience wiser leadership, particularly in areas that involve explicit ethics and values related issue. How do you measure Responsible behaviour? How do we learn Wisdom? How do we learn to live with Responsibility? How could we develop a Wise Society Index? Are those at the top actually more Responsible? How could we develop a Leadership Performance Index? How could you audit / measure values / trust levels? Where does passion/commitment come from? And how can it be developed? Are there Gender differences in the Power <> Responsibility agenda? How could this analysis link into the assessment of Governance effectiveness? How important is the trust dimension in change ‘management’ issues (ie Power <> Responsibility)? What is the relevance of Power <> Responsibility issues to stress related problems? What are the general issues around the Power <> Responsibility relationships? How does the meaning of the words Power <> Responsibility differ in different languages? Where do megalomaniac tendencies come from? How do we measure whether we have a ‘Knowledge is Power’ or a ‘Sharing Knowledge’ culture? How do we research the quality of conversations / dialogue? Do rules and regulations actually encourage more Responsible behaviour? All these questions can be researched within a specific organization and/or across stakeholders. What comparison can be made of the position across public/private and Not-For-Profit sectors? These issues also overlap with many individual and wider social problems. Aubrey, R and Cohen, P. M. (1995). Working Wisdom: Timeless Skills and Vanguard Strategies for Learning Organizations. Jossey-Bass. Baltes, P. B. (2004). Wisdom as Orchestration of Mind and Virtue, (book in preparation – www.baltes-paul.de/Wisdom.html). Barrett, L. F and Salovey, P. (Editors). (2002). The Wisdom in Feeling: Psychological Processes in Emotional Intelligence. The Guildford Press. Bloom, H. (2004). Where shall Wisdom be Found? Riverhead / Penguin. Bourgeault, C. (2003). The Wisdom Ways of Knowing: Reclaiming an Ancient Tradition to Awaken the Heart. Jossey-Bass. Brague, R. (2003). The Wisdom of the World, University of Chicago Press. Broomfield, J. (1997). Other Ways of Knowing: Recharting our Future with Ageless Wisdom. Inner Traditions. Bunson, M. E. (Editor). (1997). The Dalai Lama’s Book of Wisdom. Rider. Ching, J. (1976). To Acquire Wisdom. Columbia University Press. Cleary, J.C. (Editor). (1991). Worldly Wisdom: Confucian Teaching of the Ming Dynasty. Shambhala. Conway, D. (2000). The Rediscovery of Wisdom: From Here to Antiquity in Quest of Sophia. Macmillan Press. Costa, J. D. (1995). Working Wisdom: The Ultimate Value in the New Economy. Stoddart. Covey, S. R. & Merrill, A. R. (1994). The Wisdom Literature, Appendix C in First Things First. Simon & Schuster. Curnow, T. (1999). Wisdom, Intuition and Ethics. Ashgate. Deane-Drummond, C. (2006). Wonder and Wisdom. Templeton Foundation Press. Devereux, P. (2002). Living Ancient Wisdom: Understanding and Using its Principles Today. Rider. Dyer, W. W. (1998). Wisdom of the Ages; Eternal Truths for Everyday Lives. Thorsons. Feldman, R. (2000), Wisdom: Daily Reflections for a New Era. Saint Mary’s Press. Figueria, T. J, Brennan, T. C. and Sternberg, R. H. (2001). Wisdom from the Ancients. Perseus Publishing. Fletcher, J, Matschek C, Siebert A, and Tycer G (2003), Gathering Wisdom. Practical Psychology Press. Follmi, D. & Follmi, O. (2000). Indian Wisdom 365 days. Thames & Hudson. Gabriel, M. (1954), The Decline of Wisdom, The Harvil Press. Goldberg, E. (2005), The Wisdom Paradox: How your mind can grow stronger as your brain grows older. Free Press. Gouinlock, J. S. (2004), Eros and the Good: Wisdom according to nature. Prometheus Books. Gracian, B. (1993). The Art of Worldly Wisdom, adapted from the translation by Joseph Jacobs. Shambhala. Jacobs, A. (2005). The Ocean of Wisdom. O Books. Kekes, J. (1995). Moral Wisdom and Good Lives. Cornell University Press. Kilberg, R. R. (2006), Executive Wisdom. American Psychological Association. Macdonald, C. (1993). Toward Wisdom: Finding Our Way to Inner Peace, Love & Happiness. Hounslow Press. Manz, C. C, Manz, K. P, Marx, R. D. and Neck, C. P. (2001), The Wisdom of Solomon at Work. Berrett- Koehler. Marcis, D. (1997). Managing with the Wisdom of Love. Jossey-Bass. Maxwell, N. (1984). From Knowledge to Wisdom. Basil Blackwell. McLyman L. A. (2005), Wise Leadership (2005). Mitchigan State University Press. Midgley, M. (1989, paper 1991). Wisdom, Information and Wonder: What is knowledge for? Routledge. Mitchell, S. (1998). The Essence of Wisdom. Broadway Books. Novak, P. (1994). The World’s Wisdom. HarperSanFrancisco. Pruzan, P and Pruzan M.K. (2007). Leading with Wisdom: Spiritual-Based Leadership in Business. Greenleaf Publishing. Raineri, E. K. (1996). Wisdom in the Workplace: On the Job Training for the Soul. Braino Inc.
Reed, R. (1998). Practical Wisdom & Timely Advice. Catawba Press. Rockwell, I. (2002). The Five Wisdom Energies. Shambhala Publications. Saher, P.J. (1969). Eastern Wisdom & Western Thought. George Allen & Unwin. Shanahan, T. and Wang, R. (2003, second edition). Reason and Insight: Western and Eastern Perspectives on the Pursuit of Moral Wisdom. Thomson Wadsworth. Smith, R. L. (1998). A Quaker Book of Wisdom. Orion. Solomon, R. C. and Higgins, K. M. (1997). A Passion for Wisdom: A Very Brief History of Philosophy. Oxford University Press. Sternberg, R. J. (Editor). (1990). Wisdom: Its nature, origins and development. Cambridge University Press. Sternberg, J. R. (2003). Wisdom, Intelligence, and Creativity Synthesized. Cambridge University Press. Sternberg, R. J. and Jordon J. (Editors) (2005). A Handbook of Wisdom: Psychological Perspectives. Cambridge University Press. Surowiecki, J. (2004). The Wisdom of Crowds. Random House. Sveiby K-E, and Skuthorpe T. (2006). Treading Lightly: The Hidden Wisdom of the World’s Oldest People. Allen & Unwin. Tolstoy, L. (1997). A Calendar of Wisdom: Wise Thoughts for Every Days. Hodder & Stoughton. Upton, C. (1959). What is Wisdom? Linden Press. Warburton, O. (2000). Wisdom for the Ages. Lion Publishing. Watts, M. (1997). The Wisdom of Saint Columba of Iona. Lion Publishing. Wolff, R. (2001). Original Wisdom: Stories of an Ancient way of Knowing. Inner Traditions. Achenbaum, W.A. (1997). The Wisdom of Age- An Historian’s Perspective. Institute on Aging, University of Michigan, April 3. Ackoff, R.L. (1989). From Data to Wisdom, Presidential Address to ISGSR, June 1988, R.L Journal of Applied Systems Analysis. Volume 16, p3-9. Ardelt, M. (2000). Intellectual versus Wisdom-Related Knowledge: The Case for a Different Kind of Learning in the Later Years of Life. Educational Gerontology, 26: 771-789. Ardelt, M. (2003). Empirical Assessment of a Three-Dimensional Wisdom Scale. Research on Aging, vol25, no3, May, 275-324. Ardelt, M. (2004). Wisdom as Expert Knowledge System: A Critical Review of a Contemporary Operationalization of an Ancient Concept. Human Development, 47: 257-285. Ardelt, M. (2005). How Wise People Cope with Crises and Obstacles in Life. Revision, Vol 28, No1, Summer, p7-19. Atlee, T. (2002/3). Empowered Dialogue Can Bring Wisdom to Democracy. (as “Wisdom, Democracy and the Core Commons’ in Earthlight, Fall/Winter (www.earthlight.org)). Awbrey, S. M, and Scott, D.K. (1995). Knowledge into Wisdom: Unveiling Inherent Values and Beliefs to Construct a Wise University. Baltes. P.B. and Kunzmann U. (2004). The Two Faces of Wisdom as a General Theory of Knowledge and Judgement about Excellence in Mind and Virtue vs. Wisdom as Everyday Realization in People and Product. Human Development, 47:290-299. Baltes, P.B, Staudinger, U.M, Maercker A, and Jacqui Smith, J. (1993). People Nominated as Wise: A Comparative Study of Wisdom-Related Knowledge. Psychology and Aging, Vol 10, No2, pp155-166. Baltes, P.B, and Staudinger, U.M, (2000). Wisdom: A Metaheuristic (Pragmatic) to Orchestrate Mind and Virtue Toward Excellence. American Psychologist, Vol 55, No1, pp122-136. Bellinger, G, Castro, D, and Mills, A. (2004). Data, Information, Knowledge, and Wisdom. Systems Thinking. Bezold, C, Bettles, C, and Fidler, D. (2008). Wiser Futures: Using Futures Tools to Better Understand and Create the Future. The Institute for Alternative Futures, presentation to 2008 Annual Conference of World Future Society. Bierly III, P. E, Kessler, E. H. And Christensen, E. W. (2000). Organizational Learning, Knowledge and Wisdom. Journal of Organizational Change Management, vol 13, issue 6, p595-618. Bluck, S. and Gluck, J. (2004). Making Things Better and Learning a lesson: Experiencing Wisdom Across the Lifespan. Journal of Personality, 72:3, June, 543-572. Brown S.C, and Greene, J.A. (2006). The Wisdom Development Scale: Translating the Conceptual to the Concrete. Journal of College Student Development, January/February, vol47, no1, pp1-19. Case, P, and Gosling, J. (2007). Wisdom of the Moment: Pre-modern Perspectives on Organizational Action. Social Epistemology A Journal of Knowledge, Culture and Policy, Volume 21 Issue 2, April- June, pp87-111. Chatterjee, D. (2006). Wise Ways: Leadership as Relationship, Journal of Human Values 2006, 12; 153-160. Curnow. T (2000). Wisdom and Philosophy. Practical Philosophy, March, Volume 3.1 page 10-13. Gluck, J, Bluck S, and Baron, J. (2005). The wisdom of experience: Autobiographical narratives across adulthood. International Journal of Behavioral Development, 29 (3), 197-208. Hall, S.S. (2007). The Older-and-Wiser Hypothesis. The Times Magazine, May 6. Hammer M. (2002). The Getting and Keeping Of Wisdom: Inter-Generational Knowledge Transfer in a Changing Public Service. Research Directorate, Public Service Commission of Canada, October. Jearnott, T.M. (1989). Moral Leadership and Practical Wisdom. International Journal of Social Economics, vol 16, No 6, p14-38. Kekes, J. (1983). Wisdom. American Philosophical Quarterly, Volume 20, Number 3, July, pp277-286. Kessler, E. H. (2006). Organizational Wisdom: Human, Managerial, and Strategic Implications. Group & Organization Management, vol 31, no3, 296-299. Korac-Kakabadse, N, Korec-Kakabadse, A, and Kouzmin, A. (2001). Leadership Renewal: Towards the Philosophy of Wisdom, International Review of Administrative Sciences, Volume 67, Number 2, June, pp207-227. Kupers W.M. (2007). Phenomenology and Integral Pheno-Practice of Wisdom in Leadership and Organization, Social Epistemology A Journal of Knowledge, Culture and Policy, Volume 21 Issue 2, April-June, pp 169-193. Leggat, S.C. (2003). Turning Evidence into Wisdom. HealthcarePapers, 3 (3), 44-48. Lynch, R.G. (1999). Seeking Practical Wisdom. The Journal of Business History Conference, vol28, No2, Winter, pp123-135. Malan, L. C. and Kriger, Mark P. (1998). Making Sense of Managerial Wisdom. Journal of Management Inquiry, Vol 7, No3, September, pp242-251. Marchand, H. (2003). An Overview of the Psychology Of Wisdom. Prometheus Research Group. www.prometheus.org.uk/Files/MarchandOnWisdom. McKenna, B and Rooney, D. (2005). Wisdom Management: Tensions between theory and practice in practice. Knowledge Management in Asia Pacific Conference; Building a Knowledge Society School of Information Management and the School of Government, Victoria University of Wellington, November. McKenna, B, Rooney, D. And Liesch (2006). Beyond Knowledge to Wisdom in International Business Strategy. Prometheus, Vol. 24, No.3, September, pp283-300. McKenna, B, Rooney, D, and Bos, R. T (2007). Wisdom as the Old Dog …. With new Tricks. Social Epistemology A Journal of Knowledge, Culture and Policy, Volume 21 Issue 2, April- June, pp83-86. McKenna, B and Rooney, D. (2007). Critical Ontological Acuity as the Foundation of Wise Leadership. 6the Annual International Studying Leadership Conference Warwick Business School: Purpose, Politics and Praxis, 13th/ 14th December. Roca, E. (2007). Intuitive Practical Wisdom in Organizational Life, Social Epistemology: A Journal of Knowledge, Culture and Policy, Volume 21 Issue 2, April-June, pp195-207. Rooney, D and McKenna, B. (2005). Should the Knowledge-based Economy be a Savant or Sage? Wisdom and Socially Intelligent Innovation, Prometheus, Vol. 23, No. 3, September. Rooney, D and McKenna, B. (2007). Wisdom in Organizations: Whence and Whither. Social Epistemology A Journal of Knowledge, Culture and Policy, Volume 21 Issue 2, April-June, pp113-138. Rowley, J. (2006). What do we need to know about wisdom? Management Decision, Volume 44, Number 9, pp1246-1257. Rowley, J. (2006). Where is the wisdom that we have lost in knowledge. Journal of Documentation, Vol62, No2, pp251-270. Small, M.W. (2004). Wisdom and now managerial wisdom: do they have a place in management development programs? Journal of Management Development, Vol23 no 8, 2004, pp751-764. Smith J. (1989). Feminist Spirituality: The Way of Wisdom, British Journal of Religious Education, vol 12 (1), pp11-14. Statler, M, Roos, J, and Marterey, R (2005). Practical wisdom: re-framing the strategic challenge of preparedness, at ‘Wisdom, Ethics and Management Stream Critical Management Studies Conference’ July. Statler, M, and Karin Oppegaard, (2007). Practical Wisdom: Integrating Ethics and Effectiveness in Organizations, in Business Ethics as Practice, Representation, Reflexivity and Performance, Edited by Carter, C, Clegg, S, Komberger, M, Laske S. and Messner, M, Edward Elgar, p169-189. Statler, M, Roos, J, and Victor, B. (2007). Dear Prudence: An Essay on Practical Wisdom in Strategy Making, Social Epistemology A Journal of Knowledge, Culture and Policy, Volume 21 Issue 2, April-June, pp151-167. Staudinger, U.M, Smith, J, and Baltes P.B. (1992). Wisdom-Related Knowledge in a Life Review Task: Age Differences and the Role of Professional Specialization, , Psychology and Aging, vol 7, No2, pp271-281. Staudinger, U.M (1999). Older and Wiser? Integrating Results on the Relationship between Age and Wisdom-related Performance, International Journal of Behavioral Development, 23 (3), pp 641-664. Staudinger, U.M and Pasupathi, M. (2003). Correlates of Wisdom-Related Performance in Adolescence and Adulthood: Age-Graded: Differences in “Paths” Toward Desirable Development, Journal of Research on Adolescence, 13 (3), 239-268. Sternberg, R. J. (1998). A Balance Theory of Wisdom, Review of General Psychology, Vol2, No4, pp347-365. Sternberg, R. J. (2001). Why Schools Should Teach for Wisdom: The Balance Theory of Wisdom in Educational Settings, Educational Psychologist, 36 (4), 227-245. Sternberg, R. J. (2001). How Wise is it to teach for Wisdom? R. Sternberg, Educational Psychologist, vol36, no4, 269-272. Sternberg, R. J. (2002). It’s Not What You Know, but How You Use It: Teaching for Wisdom, The Chronicles of Higher Education, June 28. Sternberg, R. J. (2004). Words to the Wise about Wisdom? Human Development, 47:286-289. Wisdom, (2007). Special issue London Review of Education, Vol 5, no 2, July, including From knowledge-inquiry to wisdom-inquiry: is the revolution underway, Nicholas Maxwell; Commercial influences on the pursuit of wisdom, Leemon McHenry; Teaching for wisdom: What matters is not just what students know, but how they use it, Robert Steinberg et al; Wisdom and life-long learning in the twenty-first century, Richard Trowbridge; Wisdom remembered: Recovering a theological vision of wisdom for the academe, Celia Deane-Drummond; Shakespeare on wisdom by Alan Nordstrom; and Coda: Towards the university of wisdom, Ronald Barnett, as well as an Editorial, Wisdom in the university, by Nicholas Maxwell and Ronald Barnett. Wisdom, (2008). Stanford Encyclopedia of Philosophy, 8 Jan. Wisdom in Management, (2007). Special issue of Social Epistemology A Journal of Knowledge, Culture and Policy, Volume 21 Issue 2. Wisdom Society Survey Results. (2002). January. World Wisdom Rising, (2007). Special issue of Kosmos, Fall/winter. Wright, A. (2003). The Contours of Critical Religious Education: Knowledge, Wisdom, Truth, British Journal of Religious Education, 25 (4) pp279-291. Bruce spent over 20 years in industry and finance before joining the academic world a decade ago to help establish the Management Centre at what is now London South Bank University. He has a degree in Chemical Engineering and a MSc (Economics) / MBA from the London Business School. He obtained his PhD (by published work) in 1996 for his work on 'The Future of Offices and office Work: Implications for Organisational Strategy'. Over the past twenty years he has been involved on the Executive of the Strategic Planning Society and as a Council Member of the (now) Chartered Management Institute. He was a member of the latter's Advisory Board for a research project on 'Leadership: A Challenge for All' and was involved in a development of that project which was specifically concerned with leadership issues in the public sector. Since the late 1960's he has written extensively on a wide range of strategy related issues, including an article 'Leadership and Power: Where Responsibility Makes the Difference', in 'Coaching for Leadership: How the World's Greatest Coaches Help Leaders Learn', Edited by Marshall Goldsmith, Laurence Lyons and Alyssa Freas, Jossey-Bass (2000)) and more recently he has been exploring the relationship between Power, Responsibility, Leadership, Wisdom, Knowledge Management and Strategy which has resulted in several articles on that theme. He has also undertaken over 30 interviews with leading thinkers on leadership published in 'Leadership and Organizational Development Journal', as well other interviews for the 'Tomorrow Project Bulletin'. He was also the UK co-ordinator for ACUNU 'The Millennium Project' 1999-2005.